A new service that looks a little like a ‘Heroku for Node’ on the surface, but which takes some interesting approaches to the task of rapidly deploying Node apps. An extensive article inspired by Kyle Simpson’s You Don’t Know JS books, that acts as a refresher on topics like the event loop, emitters, streams, buffers, clustering, and so on. When a user visits your Fastboot-powered Ember site, the initial HTML is rendered and served from Node. Client-side then takes over. Simplify dependencies, encourage code discovery, and integrate with your CI. Bring real package management inside the firewall with npm Enterprise and unblock your team to build amazing things. A tool for analyzing the size of dependencies. Similar to disc, but for server-side instead of client-side dependencies. The main upgrade has been to npm, in which a security flaw in authentication tokens has been fixed. 5.10.1 quickly followed. A tool that tells you what’s out of date and even which dependencies are not actually being used. Provides list prompts, expansions, checkboxes, confirm prompts, multiple input types, and more. 1.0 is out and is promises-based. 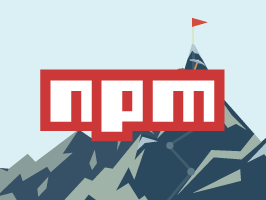 As of this week, all requests made to the npm registry are made over a secure connection. Need to Node Webinar: Blacklisting Node.js Core Modules 4/28 10am PT with Thorsten Lorenz. Learn how you can protect yourself from known vulnerabilities by blacklisting dangerous modules. A security release fixing an npm security issue. Fixes the same npm issue as above. Got regex questions? It’s next Monday at 3pm Eastern. The next in a series of beginner-focused posts. Build real-time bots in Node.js with Slack's WebSocket-based API. Read More. A year old, but I just found it and it’s pretty good. Inspired by Express and ‘suitable for anything’. Assert properties of responses, such as body, headers, and status code.